Successfully Added Teclast X5 Pro Windows Tablet PC - 256GB SSD, Intel Kaby Lake CPU, 8GB RAM, Windows 10, OTG, 12.2-Inch Display, 5000mAh to your Shopping Cart. 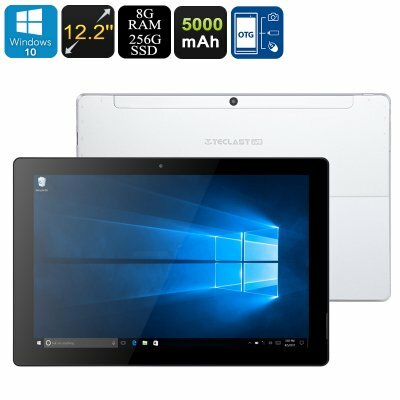 The Teclast X5 Pro is the ultimate Windows Tablet PC for those of you that are simply looking for something more. This beast of a tablet packs a stunning 256GB SSD internal memory that brings along enough storage for all your files and media. This two-in-one device can be connected to a wireless keyboard (not included) that turns it into a full-blown Windows laptop. Additionally, it packs a powerful 5000mAh battery. This cell brings along up to 5 hours of continuous usage time that will get you through the most demanding of days. If you’re looking for a tablet PC that literally can handle anything you throw at it, the Teclast X5 Pro is perfect for you. With its superb 12.2-Inch display, this tablet computer treats you with absolutely breathtaking visuals in crisp 1920x120p resolution. By supporting IPS technology, you’ll be treated to vivid color and stunning details from every viewing angle. Whether you’re into gaming, watching movies, or browsing the web, this Windows tablet supports it all. Thanks to its powerful hardware that includes the Intel Kaby Lake CPU and 8GB RAM, it can take on the latest and most demanding software available. Additional features such as Bluetooth and OTG further increase your user experience while taking the most out of all this high-end tablet has to offer. The Mini HDMI input even allows you to hook up your tablet PC to your TV set. This lets you enjoy all your movies, games, and programs on your large screen television. With its outstanding hardware, the Teclast X5 Pro offers great value for money. It outperforms many similar tablet PCs manufactured by big brands such as Xiaomi and Samsung. Whether you use it at the office for business purposes, or at home to browse the web, this Windows tablet PC will bring forth a smooth performance. It runs on a Windows 10 operating system that comes with all the trusted office features we’re familiar with. Thanks to its built-in SSD storage and 128GB SD card support, it packs all the space you need to store your files and media. Therefore, you’ll be able to use it for fun and business alike without needing to worry about storage space. By supporting Dual-Band WiFi, this magnificent two-in-one device lets you browse the web at lightning speeds. This brings along great convenience while streaming movies or engaging in online phone calls with family or colleagues. At the rear, it comes with a useful stand that allows you to set up your tablet PC vertically without needing to hold it in your hands. This feature brings along great usability when you’re watching a movie or are video calling a friend abroad.